Five suspects were remanded in custody in Turkey for promoting the PYD/PKK terrorist group’s propaganda on social media against Turkey’s ongoing military operation in northwestern Syria, according to a judicial source on Monday. In western Mugla province, seven suspects were arrested as a part of investigation launched against PYD/PKK promoters by Chief Public Prosecutor’s Office in the city. Six of the suspects were referred to a court in Mugla where five of them were remanded in custody for “making propaganda of terrorist group”, and “inciting hatred and enmity among people and humiliating them”. Also, Chief Public Prosecutor’s Office in capital Ankara issued an arrest warrant for Osman Baydemir, lawmaker of Peoples' Democratic Party in southeastern Sanliurfa. Baydemir is accused of “inciting hatred and enmity among people and humiliating them”, “insulting Turkish society, government of the Republic of Turkey, state’s institutions and organs” and “inciting fight against the government”, according to a statement by the office in Şanlıurfa. 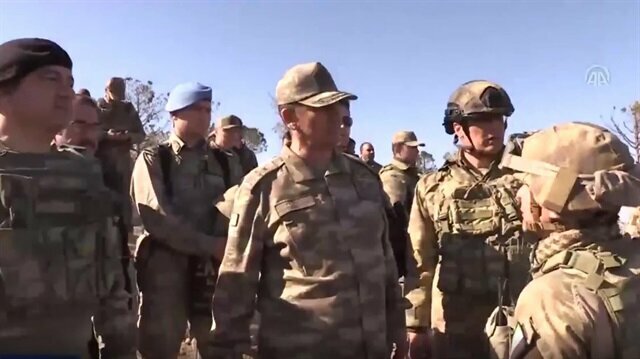 Second Army Commander Lieutenant General İsmail Temel visits troops partaking in Operation Olive Branch at Mount Bursaya. Turkish Armed Forces and Free Syrian Army (FSA) units captured Mount Bursaya on Sunday. The terrorist PYD/PKK has used Mount Bursaya to target civilians in the center of Turkey's Kilis province and Syria's Azaz district through mortar shells, artillery, and missiles. The Turkish General Staff has said the Afrin operation was aimed at establishing security and stability along Turkish borders and the region as well as protecting the Syrian people from the oppression and cruelty of terrorists. The military also said "utmost care and sensitivity" was being shown to avoid harm to any civilian. Afrin has been a major hideout for the PYD/PKK since July 2012 when the Bashar Assad regime left the city to the terror group without putting up a fight.